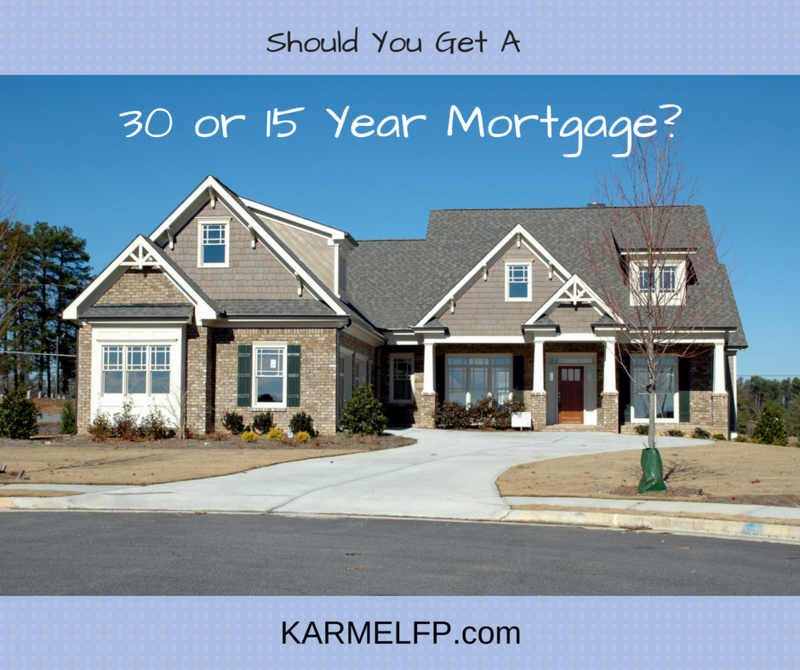 Is A 30 Year Mortgage Really Your Best Choice? Home ownership can help build your net worth. Don't make the mistake of paying more than you need to though. There are multiple factors to consider when taking on the responsibility of a mortgage. Unfortunately, most Americans ask a single question, "How much can I afford?". In my nearly two decades of experience, I've found that it's rare for someone to ask about the impact of a mortgage on their lifestyle, how it will affect their future goals such as retirement, college expenses, or getting out of debt. Even less consideration is given to the true cost of interest, in other words, how much you'll actually pay in interest over the period of time you have the mortgage. For most people, a 30 year mortgage represents flexibility and a lower payment. At first that seems logical. Take a look at the illustration below. A 30 year conventional mortgage at 4.5% and a 15 year conventional mortgage at 4.0%. $250,000 purchase, $50,000 down payment (20%), $200,000 amount financed. Not included are fees/taxes/insurance. 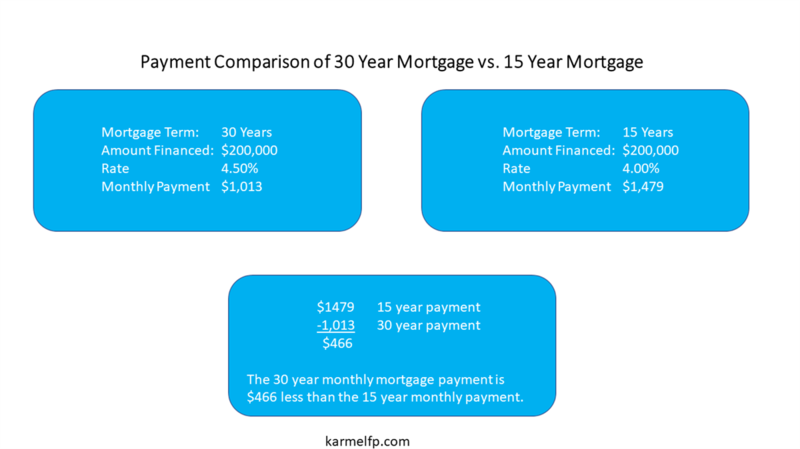 In the illustration above, you can see that the 30 year mortgage is $466 less per month than the 15 year mortgage. "What if something happens to me/us? It would be better if we had a lower payment." That is a consideration that should be accounted for. Addressing risks is an excellent exercise to do before committing to a 15 or 30 year mortgage. Building an emergency fund of 3-6 months worth of expenses? What would happen if you or your spouse were to become disabled? Are you sufficiently protected with disability insurance? What if you or your spouse died? Are you sufficiently protected with life insurance? What upcoming expenses do you have in your future? Are you saving for those future expenses? How will you pay for home repairs, maintenance, and home improvements? How long will you stay? Don’t know exactly? According to a National Association of Realtors the average length of time homeowners stay in their home is about 10 years. 2016 Profile of Home Buyers and Sellers 35th Anniversary Edition. Let’s look at interest paid after 10 years. Regardless of how long you do own your home, you will have more equity when you go to sell because you’ve paid down more of the principal. Some will make the extra payments. Most won't. What will it cost you? In order to pay off a 30 year mortgage in 15 years, you'll actually have to pay more each month to get the mortgage paid off in the same amount of time, assuming your 30 year interest rate is higher than the rate on a 15 year mortgage. 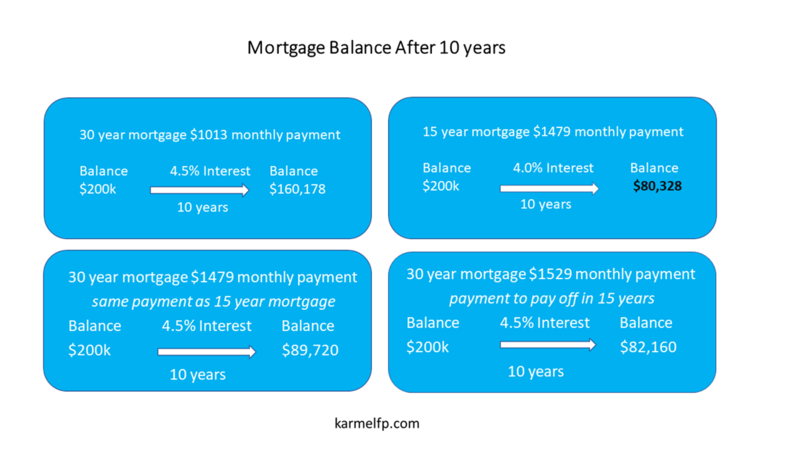 In the illustration above, after ten years, the 15 year mortgage, with a monthly payment of $1479 leaves a balance of $80,328. The 30 year mortgage, with monthly payments of $1529 which would get the mortgage paid off in 15 years, leaves a balance of $82,160. You would have paid an extra $50/month and ended up owing $1832 more. Over 10 years you would have paid an extra $6000 in interest and had a mortgage balance $1832 higher. That's a total of $7832 as your out of pocket cost compared to the 15 year mortgage. Is the flexibility worth $7800? There are situations when it makes sense to rent rather than own. For example, if you have little to no money for a down payment. If you find out you're going to have to pay PMI because you don't have a big enough down payment. If you plan to move in less than three years, renting is still probably the best option. Even if you don't intend to live in your home for 15 or 30 years, get advice from an financial professional. A mortgage is a long term commitment and is one that shouldn't be entered into lightly. Slow down, think, ask the right questions. A great question to ask is, "what questions should I be asking?" How will a mortgage impact my lifestyle today? How will it affect my future goals? Take the steps to build a strong financial foundation. Know your income and expenses. Plan ahead for the expected and unexpected. A CERTIFIED FINANCIAL PLANNER(TM) can help you. This post isn’t intended to be a discussion about the fluctuating values of homes, nor the use of leverage to finance other purchases. Rather, it is a mathematical exercise designed to help you understand the true cost and help you get clarity as to what is the right mortgage strategy for you. This is purely a hypothetical discussion. There is no intended offer. The numbers used are for illustration purposes only. This post is not intended to persuade you to buy a home. Melissa Myers,CFP® is passionate about teaching people how to master their money and pursue prosperity. Her life changed when she committed to eliminating debt, committed to using a plan to master her money, and developed a practice of expressing gratitude for the abundance in her life. You too, can strive to be master of your money and find your prosperity! If you are curious, which mortgage term is best for you, schedule your free call with Melissa by calling (231) 733-1166 or email Melissa at melissa.myers@lpl.com.